Ready to make a reservation with A1 Al’s Pheasant Ranch? A 50% deposit is required at booking in order to secure a reservation, with the remaining balance due upon arrival. Deposits are non-refundable for any reason, but if you need to reschedule, we will gladly apply your deposit toward your rescheduled hunting package/event on another available date within the current season. The total deposit cannot be applied towards the final payment when the group size or number of days hunted is reduced. Deposits can be made in the form of check, money order, or credit card (Visa, MasterCard, and Discover). Additional questions or ready to get your spot reserved with us? Contact us today or call us at 605-940-4268. Safety is very important to us at A1 Al’s Pheasant Ranch. In order for us to provide you with an exceptional hunt, it’s essential that a safe hunting environment is maintained. 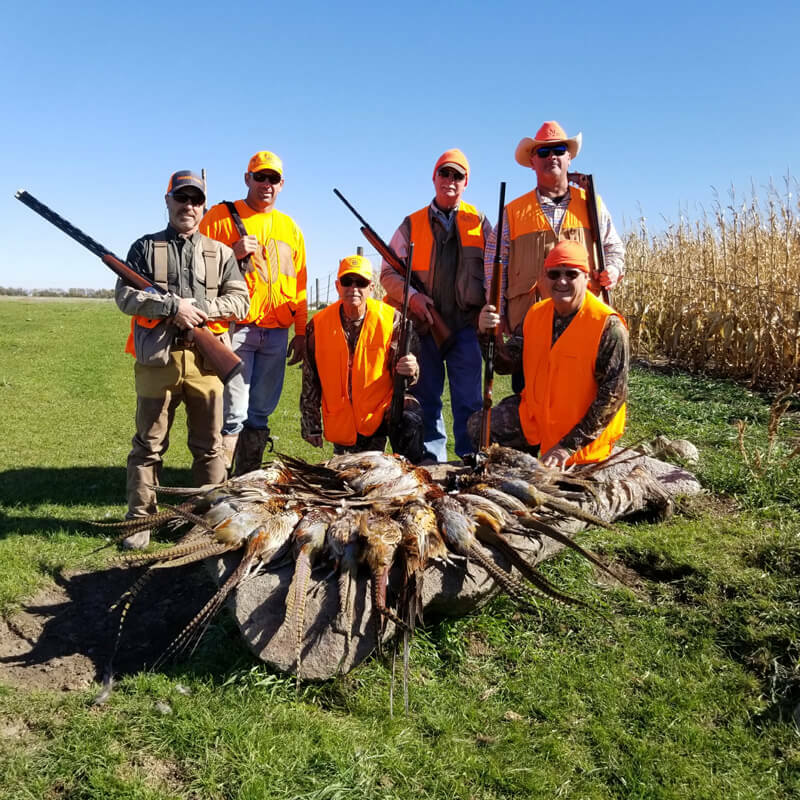 A complete safety speech and check is conducted prior to every hunt to ensure that we have a safe hunt and that everyone is aware of the state laws and regulations that apply to pheasant hunting. A1 Al’s reserves the right to terminate any hunt in which the rules and regulations are not followed. A1 Al’s Pheasant Ranch will be glad to assist your hunting party with obtaining licenses and other information upon request. Hunting licenses and handbooks of South Dakota hunting laws and regulations are also available from the South Dakota Game Fish & Parks Website. For more information on South Dakota pheasant hunting and licensing, visit the South Dakota Game, Fish & Parks website. For our guests that will be arriving by private airplane, we suggest that you fly into Mitchell or Sioux Falls, SD. A1 Al’s can also make arrangements to provide private air travel service to and from Sioux Falls, SD for our guests. Airport pick-up and drop-off is available for all of our guests arriving by air. On the days of the hunt, we will provide transportation to take you to the field and bring you back to the lodge. For our guests without their own vehicle or rental car, we will be glad to assist in making arrangements to accommodate your transportation needs. Read More at the official Cabela’s website. The World’s Only Corn Palace stands as a majestic, uniquely American, folk art icon on the rolling prairies of South Dakota. The first Mitchell Corn Palace was built just three years after South Dakota became a state – when the city was just twelve years old. Read More at the official Corn Palace website. The Mitchell population was 14,558 at the 2000 census and is only 15 minutes from the Ranch. Read More at Mitchell, SD Wiki or the official Visit Mitchell website.